Trailer Tow Package! Bedliner! Backup Camera! Brought to you in Quicksilver Metallic, our 2016 GMC Sierra 2500 SLE Crew Cab 4X4 offers all the power and features you desire! Powering this strong truck is a brawny Vortec 6.0 Liter V8 that provides a healthy 360hp while tethered to a durable 6 Speed Automatic transmission that makes hauling or passing an easy task. This Four Wheel Drive provides impressive acceleration and massive towing/hauling capability that will exceed your expectations. Style meets substance in this sharp-looking Sierra 2500 SLE with its chrome bumpers, power adjustable heated mirrors, remote locking tailgate, and strong wheels. The thoughtfully-designed SLE cabin greets you with keyless entry, a leather-wrapped steering wheel, power windows, and a driver information center. Staying safely connected is easy with Bluetooth and our touchscreen audio system with IntelliLink, USB Ports, auxiliary jack, available HD/satellite radio, and OnStar with a WiFi hotspot. Imagine yourself taking on your day in this brute! You ll feel confident and in control in our GMC with a rearview camera, anti-lock disc brakes, traction and stability control with trailer sway control, front-seat side airbags and full-length side curtain airbags. 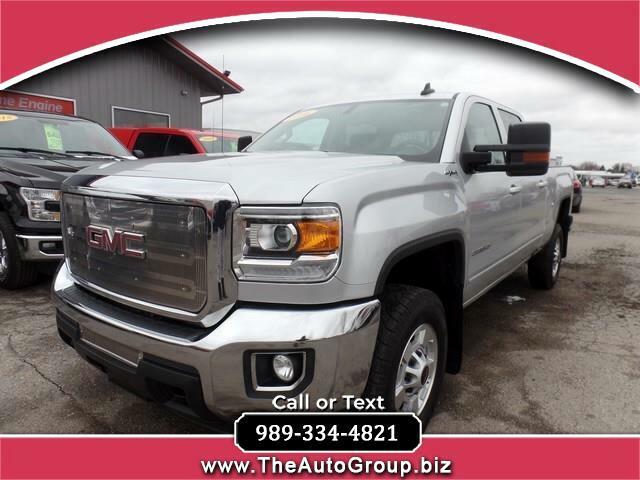 Solidly built with all the refinement and style you can imagine, this Sierra is calling your name! Print this page and call us Now... We Know You Will Enjoy Your Test Drive Towards Ownership!